PM essentially confirms Herzog's criticism that the government is waiting for terrorists to attack Israeli civilians before doing anything. Prime Minister Binyamin Netanyahu on Sunday evening responded to the threat of Hamas rebuilding its terror tunnels into sovereign Israeli territory, by essentially confirming the criticism leveled at him by Opposition head MK Yitzhak Herzog (Zionist Union) earlier in the day. "We are working methodically and with level-headedness against all threats including the threat from Hamas, both through defensive measures and through offensive measures," said Netanyahu, in a conference with Israeli ambassadors at the Foreign Ministry in Jerusalem. 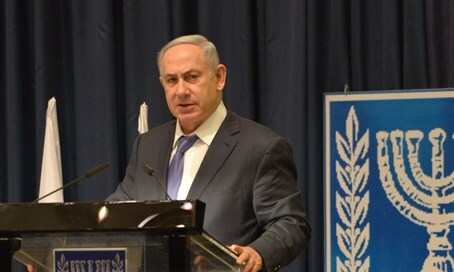 "Of course if we are attacked from the tunnels in the Gaza Strip we will act with very great strength against Hamas, and with much greater strength even than that of (2014) Operation Protective Edge," he said. The Prime Minister added, "I think that they understand that in the region, they understand that also in the world. I hope that we won't need it, but our abilities, both defensive and offensive, are developing rapidly and I wouldn't propose to anyone to test us." Ironically Netanyahu's words dovetail those of Herzog, who charged that the government is merely waiting for an attack. His criticism came in light of reports that Hamas terror tunnels are already reaching into Israeli territory again, as the terror group rebuilds its tunnel system that was greatly damaged in Protective Edge. "What are they waiting for? For terrorists with weapons drawn to come into a kibbutz or moshav? The Prime Minister and Defense Minister owe the civilians an answer," Herzog said earlier on Sunday. "Residents of the Gaza Belt report that they are hearing the sounds of the tunnel digging under their homes. The Egyptians are blowing up Hamas's tunnels on the Rafiah border without hesitating. The political echelon needs to give a public and clear response to the residents. To stop hesitating. They owe the civilians serious answers." "They need to order the IDF to blow up the tunnels and to eliminate this threat. Especially if there are tunnels that already have passed under Israel's borders. Hamas is bragging and we are doing nothing, we will wake up one day and discover that we again underestimated the severity of the threat. It will cost us in blood and awful sadness," he warned. Hamas swiftly began rebuilding its tunnels immediately after the ceasefire in Protective Edge, and currently more than one of its tunnels has already crossed underneath the border with more as yet unknown tunnels estimated to be well in the works. In Protective Edge, Netanyahu's approval rating plummeted from 82% at the start of the operation to just 38% at its end amid the ceasefire with Hamas, largely over a feeling that the government did not take decisive enough action to achieve security for residents of the south.